Today I’m here to introduce a new type of article: Team Archetypes. These articles will delve into different types of archetypes VGC teams have formed, how they operate and how they can be countered. Sets for each Pokemon mentioned here can be found on Brigette’s PC in a format ready to be imported onto Showdown so you can try out the team in no time. To start off the series I’ll be looking at the Mega-Venusaur team archetype. My Top 4 Washington Regionals Team falls into this archetype. This Team won the Spring 2014 Asia Cup and is what I consider to be the standard for the Venusaur archetype. Another more recent team also followed this archetype to take 6th place at New England Regionals. 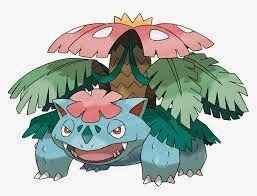 This archetype focuses on Mega Venusaur, a defensive behemoth that can survive almost any un-boosted attack in the format. This team plays a chess-style game where you try to take out the one or two Pokemon that stop your Pokemon of choice from sweeping/walling the opponent’s remaining Pokemon while keeping your win condition safe. This team often focuses on both the Grass/Fire/Water core and the Dragon/Fairy/Steel core to make for easy switches. Mega Venusaur obviously fills in the Grass type spot on the team. For the Fire type slot Rotom-Heat is an obvious choice that counters Talonflame in addition to its Fire type duties. Azumarill is a common choice for the Water type for the first core, while also being a Fairy for the second core as well. Garchomp and Salamence are the goto choices for Dragon types, either one or both often make it on the team. Aegislash is a great Steel type for the team that also hard counters Kangaskhan. The aforementioned Azumarill counts as our Fairy type. Since both cores can be completed using five Pokemon the last slot can be left open for another Pokemon outside either core or another Pokemon that doubles up on an existing type. The team doesn’t need to use the above six Pokemon, so long as their roles are fulfilled. Since Venusaur has trouble with certain teams, this kind of team can benefit from an alternate Mega Evolution. Having an alternate Mega makes it tougher for your opponent to chose the right Pokemon to bring against you and can allow you to change your strategy during best-of-three matches. Either Mega Charizard can be used as an alternate Mega to make your opponent question whether or not you’re a sun team or not. Lucario and Mawile are also great alternate Mega Pokemon that deal with Kangaskhan handily and become the Steel type on the team. Special mention goes to Lucario which can function as a non-mega Pokemon while still keeping your opponent guessing. Outside of alternate mega Pokemon we also have other choices for the members of each core. Rotom-W can take Azumarill’s place, though we’d need to replace Rotom-H and there isn’t a great replacement for the toaster. Gyarados provides Thunder Wave support, another Intimidate, and another partner that Garchomp can Earthquake freely beside. Bisharp can replace Aegislash to scare away Intimidate users and threaten with Sucker Punch, Assurance and Quick Guard. Scizor is another option for dealing with Gardevoir with a Life Orb Bullet Punch. Wigglytuff can also scare away Intimidate users and fill the Fairy role. Gardevoir is another great option for a Fairy type that can run a wide range of sets. All of these traits are great to have. This team archetype can also deal with several Pokemon I had trouble with, like Kangaskhan and Azumarill. The greatest strength of this team is that every member is good at what it does without support and everything comes together by providing offensive and defensive synergy with each other. If you can get rid of the two most threatening Pokemon on the opponent’s team Venusaur can often make a grand stand against the last two and come out on top. Defeating Mega Venusaur requires either a way to OHKO it, or double targeting it (possibly for two turns). Staraptor and Talonflame can take out Venusaur with their Flying moves, although Mega Venusaur often run enough HP and Defence to withstand Talonflame’s Brave Bird boosted by Life Orb. With Intimidate support Venusaur will be able to take a Brave Bird from either Pokemon. Staraptor also has the option to use Final Gambit to take out Venusaur. Gardevoir with Choice Specs and OHKO Mega Venusaur with Psychic. Mega Kangaskhan will beat Venusaur one-on-one, so long as you can get around Venusaur’s partner. Doubling up on Venusaur can take it out, however this is a risky option as you could lose your whole turn to a Protect. Bisharp with Assurance is great for this as it will finish off a Venusaur that took a solid hit already. So once your team has a way of dealing with Venusaur it needs to deal with the whole team. Rotom-W threatens the rest of the team with Thunderbolt and Hydro Pump, Rotom-H with Hidden Power Ice also deals with most of the team. Gardevoir puts pressure on the whole team sans the Steel type, doing a number to Venusaur with Psychic and dominating the Dragons with Moonblast. Bisharp can follow up on a spread move with Assurance to KO most of the Pokemon on the team, but this does require a double target. Overall, having at least one of the Pokemon that can OHKO Mega Venusaur and keeping it around long enough to take Venusaur out is the best way to deal with this team. The Pokemon this team hates the most are Kangaskhan, Rotom-W, Talonflame and Gardevoir. These Pokemon are fairly common and if you can play them well you’ll have a good shot at taking this team down, so long as you’re able to keep them away from their counters. Of all the team archetypes I’ve tried this format, this one has been my favourite by far. It fits my play-style of focusing more on countering the opponent’s strategy then setting up my own. This team has done well in the last set of Regionals and I expect it to do well at Nationals. If your team lacks a good way to KO Venusaur you can still beat it by making the proper predictions throughout the game, but relying on out-predicting your opponent all game is unreliable no matter how good you are. It would be wise to practice with and against this team archetype so you know how to deal with it. Let us know if you found this article useful and we’ll make more!